Guided visualisation is a powerful way to bring about positive states of well-being. It works with the subconscious mind through the power of suggestion and metaphor, and gently imprints the body’s neural pathways and cellular memory with feel-good, insightful experience. Each of these three meditations are incredibly relaxing, but there's more to "Journeys to Inner Peace" than just relaxation. 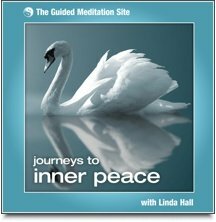 These guided meditations will really put you in touch with your own inner power and self-worth. This download also includes a wonderful manifestation meditation in which you are guided to realise your wishes, hopes and dreams. The tender and optimistic tone of these guided meditations will touch and inspire you. "I am loving ‘Journeys to Inner Peace’. Each of the 3 meditations offer so much. I have since carried with me a felt sense of having something within me of beauty and this feels a real gift"
"This is truly a beautiful piece of work and has been wonderful to use on a daily basis"
"Journeys to Inner Peace is amazing, each visualisation meditation unique in its own right. ‘The Garden’ is extremely relaxing; the ‘Sun and Moon Meditation’, mindful and spiritual; and ‘The Gift’, thought provoking, emotionally enhancing and freeing".